Visco series rotational viscometers allow fast and accurate. viscosity readings. They are low budget and easy to use. 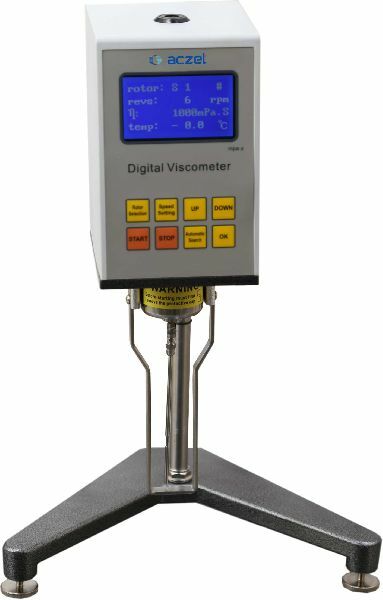 Our Visco series is Rotational Digital Direct Reading Viscometer to measure absolute viscosity of Newton Liquids as well apparent viscosity of non-Newton liquid featured by high flexibility reliable Test result, easy operation and good appearance. Standard Delivery : Viscometer head with serial number / Stand, 3 levelling adjustment for stand / Boss head / Standard spindles / Spindle protector / Spindle rack / Power supply cable / Calibration Certificate / Operating manual. Extra Accessories : APM (Small Sample Adapter) / LCP (Low Viscosity Adapters) / Heldal unit (High Viscosity Adapter) / Silicon Standard Oils / Thermostatic Bath / Universal adapter for all accessories such as Brookfield (Optional) / PPR Plugging system (Optional) Note : The material of the accessories including the temperature probe can be changed under customer specification (High Temperature Resistance). Precision : ± 1% of full scale. Spindles AISI 316 stainless steel spindles, easily identified by number and letter when changed according to range of viscosity.